Before we begin, RC would like to apologize for our five-day absence. Aside from the actual games, we had a great time in Baltimore over the weekend, and we're ready to get back to work. The GMAT...ehhh, well...the good news is that we plan to take it again very soon after we spend a little more time studying the math we had [falsely] assumed would come back to us after taking all the math we took in college several years ago during what we refer to as "The Engineering Year." Anyway, the series in Baltimore was a complete disaster, which was particularly disappointing after sweeping the Tribe. There's not a whole lot to add that hasn't already been written elsewhere: Too many walks, missed opportunities, poor managing, etc...The ninth inning on Friday was a joke that had RC howling at anyone who would listen, and Saturday was the type of blowout that's easy to forget (particularly when you're abiding by a strict beer-an-inning policy). Sunday's contest was among the worst-pitched games we've seen outside of the Carolina League, and it was remarkable how unshocked we were to see the Royals blow it -- we actually expected it! Buddy Bell hits grounders to Tony Graffanino before the game, because Lord knows, Graffanino NEEDS to get his work in at 3B. 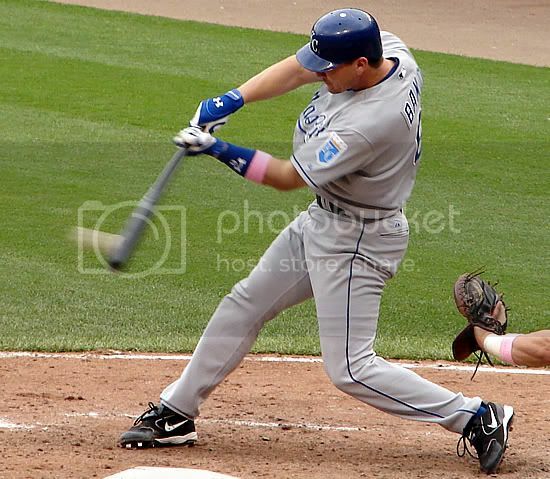 Kerry Robinson shows off his textbook swing that has made him a Major League starter and leadoff hitter. Paul Bako makes solid contact. Really. Esteban German worked out at second base for some reason. Aaron Guiel is naturally tentative. 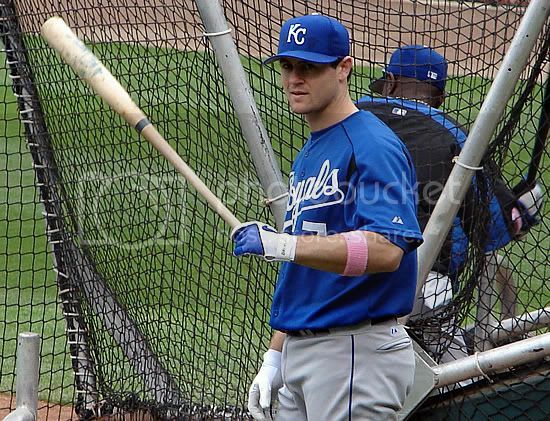 We're still not sure why Justin Huber was taking batting practice. MacDougal is a big Mike Stodolka fan. 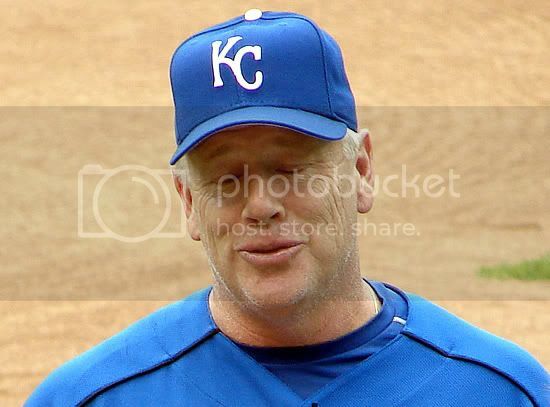 "it was remarkable how unshocked we were to see the Royals blow it -- we actually expected it!" Oh no! Is your trademark optimism in danger of going up in flames? Maybe this has something to do with the Baird saga. What's your read on that situation right now? JoePo and others are speculating that Glass was ready to fire Baird two weeks ago but all the candidates he's talked to have turned him down. Makes sense to me. Oh, the optimism isn't gone. The Royals just played so poorly over the weekend that I boiled over a bit. This team can just be so frustrating to watch, particularly when Buddy Bell's lineups consistently get even more ridiculous. Case-in-point: Esteban German is out of the starting lineup AGAIN tonight, in favor of Tony Graffanino. What the hell? I'll tell you what, I was wrong about Graffanino. Remember, I actually liked the pickup, because I thought Tony G. would be a valuable player off the bench. Many people pointed out at the time that Bell simply can't be trusted with players like him on the bench, because he'll ALWAYS play the veterans over the young guys who should be getting at bats. I thought that was a pretty silly argument, but sweet Jesus, was I wrong! What a joke. It really makes me sick. I totally agree Dave. I thought Graf was a great pickup, a huge improvement over McEwing. A steady bench player who could pinch hit, spell Teahen against lefties, fill in for Angel and rest Grudz. Never in my worst nightmares did I think he'd be leading off, DHing, or playing 1B. It is ridiculous Buddy keeps trotting out the Over the Hill Gang. It is ridiculous he keeps three players on the bench with OPS over .800 (Guiel, German, Huber) while they play Stairs, Graffanino, Kerry Robinson and Minky. 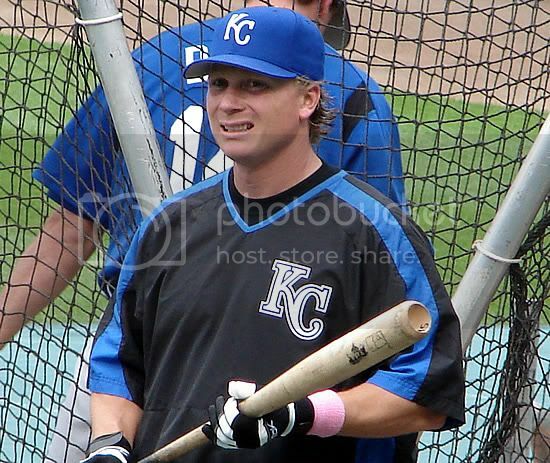 And it was simply ridiculous to hire a guy with the losing track record Buddy Bell has anyway. We shouldn't be all that surprised. Ah well, at least it makes me more interested in RC's minor league reports, since that's the only hope I have for this team. Sitting Huber on the bench is the only way to mess it up. 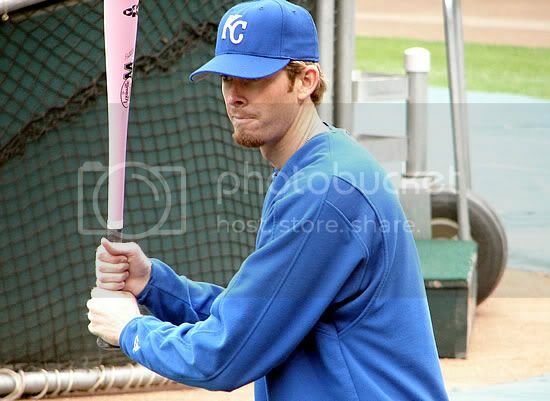 Don't forget it, if the Royals can somehow mess something up, THEY WILL! The problem: A K-Rob demotion will only prolong Huber's bacterial degredation on the bench. In tonight's starting lineup, there's no Buck, no German, and no Huber. Plenty of Stairses, Mientkiewiczes, Guiels, and Graffaninos, though. 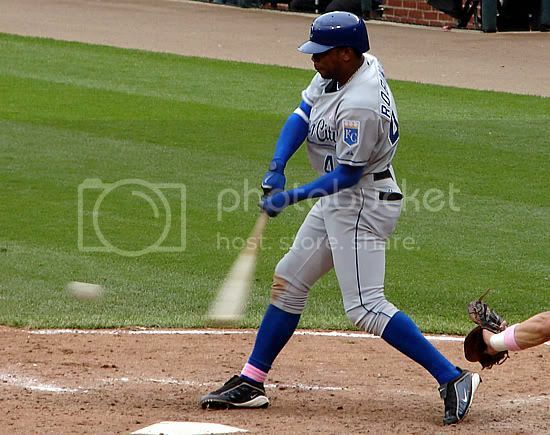 Graffanino does have experience at SS, and while he might not have great range, I am just sick and tired of watching Berroa botch routine play after play after play after play and swinging at pitches in the dirt over and over and over and over and over and over. 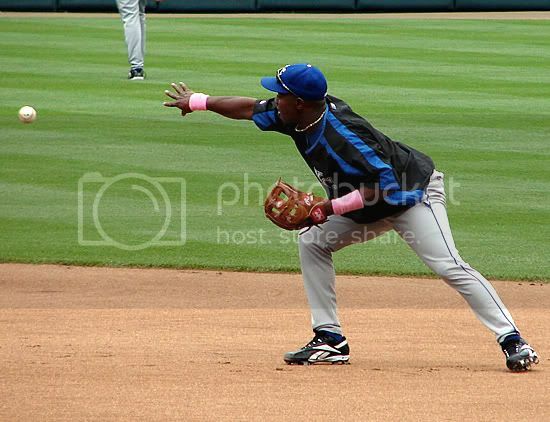 Trade or release Berroa immediately. He is worthless. LMAO at Graffanino's botched play @ third that turned into a Hafner bomb. So typical. We just gotta keep that guy starting while German sits. And on top of everything else, Buddy's also relieved Ambiorix of his closer duties, citing the player's shaken confidence as his reason for the decision. Call me crazy, but isn't that why Burgos is here? To fail and learn from his mistakes? Buddy's a moron.